The CAS AP series are very popular with busy retailers due to its large platter size, pole display and robust build quality. Choose 6kg, 15kg, or 30kg capacity. 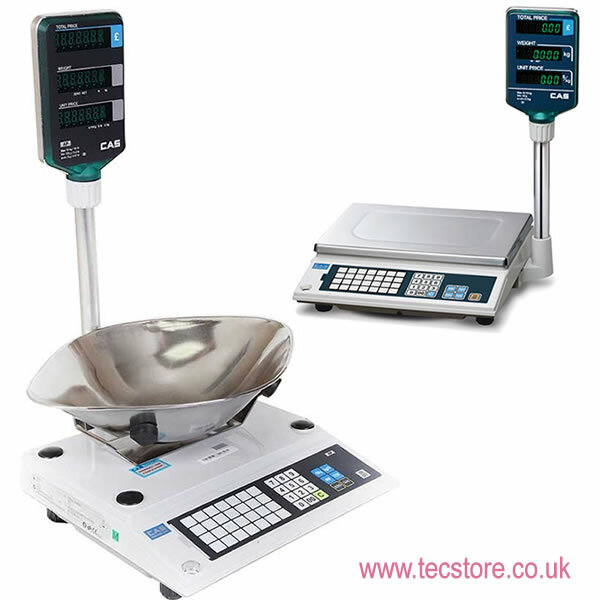 The AP scale is suited to various retail applications including butchers, greengrocers, fruit & veg stores, sweet shops and small supermarkets. It is easy to use and easy to clean. The AP has Zero and Tare functions, with auto zero tracking and auto span adjustment, making it versatile and reliable. It has 28 preset keys for your popular items to have their Price per Kg weight stored. Bright fluorescent VFD tower display allows both the operator and the retail consumer to see the weight, price per kg and calculated price. Large stainless steel platter, size 340mm width x 215mm depth. Unit size 435mm width x 325mm depth x 495mm height. New AP specification operates in Metric mode (kg, g) only. (Previous models that could be switched to Decimal Imperial (lbs/pounds) mode are no longer available in the UK). Optional Stainless Steel Scoop available as factory-fitted option for Fruit & Veg or Sweets. See options above. Operating temperature: -10 to 40 degrees Celsius.